Meet our team and discover how we became one of the top restaurants in Woburn Sands. Nonna’s has grown from nothing to be a social hub where people can come and enjoy the company of the ones they love while appreciating delicious food. Back when owning and running a restaurant was a mere pipe dream, Damien stumbled across a recently closed down bakery in Woburn Sands. Damien saw the potential for the building to be transformed into a bustling restaurant where people can enjoy each others company and high-class food. Damien says, "When something clicks the yes button in my head it is similar to a light switch, it either is 'on' or 'off', 'yes' or 'no'. And something here just hit me with a BIG YES"
Damien worked with his family and friends to renovate this classic building into the wonderful restaurant you see today. He restored the building and added a beautiful summer terrace and convenient car park. The interior was completely revamped and the kitchen upgraded. Damien says, "Three-quarters of the way through this mission I had jumped head first into was most probably the hardest moment in my life. We had run out of money, my business partner (head chef) left and I wasn't sure Nonna's would become a reality.... . But my passion for food kept me going." After many hours of labour and hard work, Nonna's was ready for opening night. Damien invited a selection of local people and his friends to enjoy this unique experience. 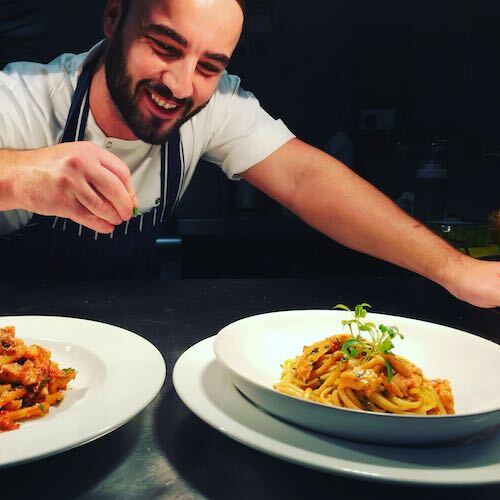 We are sure you will thrive in the warm, friendly, and bespoke atmosphere of Nonna's. Whether you are grabbing a coffee in the Brasserie or indulging in a three-course meal in the restaurant, your experience will be remembered for all the right reasons. Damien's philosophy is to never give up and always provide quality. The quote on the entrance reminds us all of that aim and gives us something to strive toward every day. Our owner Damien went from a home cook to running a restaurant that truly reflects his family roots and insatiable passion for food. Why not take a look around before you visit. You can really get a feel for what Nonna's has to offer and choose your experience. Browse our selection of menus and see what we have to offer.